Great selection of games available, powered by reputable software providers. Bonuses and promos target both new and registered players. Mobile casino version is very good, and offers a wide range of games. A large variety of currencies available. Online casino players are spoilt for choice when it comes to choosing a casino to play at. With hundreds if not thousands of options available, it can get pretty difficult to make an adequate choice. This is where tools such as this Casino.com review comes in handy, as it provides a well rounded summary of all the key features that one can expect to find at this online casino. Casino.com has been operating since 2007, and it is fully licensed and regulated in the reputable state of Gibraltar, which is very well established in the online gaming industry. In this Casino.com review, readers will be able to obtain key information about the games available at this online casino, bonuses and promotions, and other vital features such as payment options, customers support, and security. Further down this Casino.com review, interested players can also find a Casino.com mobile review that will cover similar features for mobile device users. Casino.com is accessible on both desktop computers and mobile devices such as smartphones and tablets, which makes it quite a readily available website. So, with further ado, let’s kick this Casino.com review with some basic technical information about this incredible casino. Players reading this Casino.com review will be happy to know that they have two options in order to access this online casino on desktop computers. They can either download and install the Casino.com software directly to their computers, or they can either opt for a no download instant play option. The downloadable software is compatible with numerous version of Windows OS. Instant Play mode works directly in the web browser, and is compatible with both Windows and Mac OS computers, provided that they have Adobe Flash Player installed on their devices. Creating a new account at Casino.com is quite straightforward. The entire process involves three simple step, with entering of personal details, setting up of account details, and confirmation. 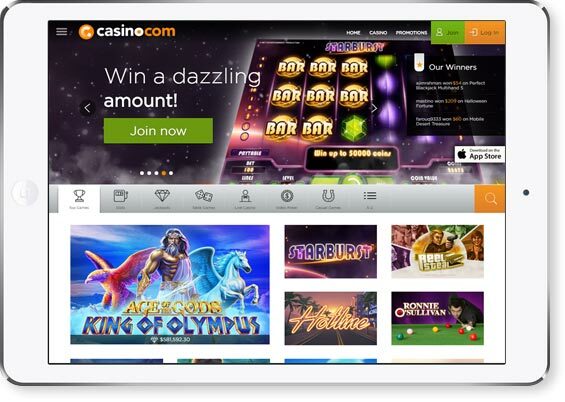 Players reading this Casino.com review who wish to open a new account need to click on the green ‘Join’ button that is located on the top right corner of the welcome page. Once this is done, a new window will open to start the registration process. In the first step, players will be asked to enter personal details, such as name, surname, address, and contact information. In the second step, players will be required to select a unique username that they will use when playing at Casino.com. In addition, they will also be asked to select the currency of their main checking account. This is an essential step, and players are always recommended to choose a currency that is the same as their main payment method to avoid unnecessary charges. In addition, players will also be asked in this step to enter a bonus code, which in this case will give them the Welcome Bonus offer which they are eligible for as new players. More information about this and other promotions is located further below in this Casino.com review. In the last step, players need to confirm their account. Following this, they can login to their account when they wish, starting making their first deposit, and start playing. Most players reading this Casino.com review will be eager to find out all about this online casino’s bonuses and promos. In fact Casino.com is well known to offer new and existing players a wide range of generous promotions. The welcome bonus is the main attraction of the offers available to players reading this Casino.com review. Players automatically receive a set number of free spins upon registration without the need to make a deposit, which can be used on a specific slot game. In addition to this, there is an additional bonus that is collected upon making the first deposit. This consists of a match bonus up to a specific amount on the first deposit, as well as additional free spins. In addition to the welcome bonus, registered players of this online casino reading this Casino.com review can also make use from a wide range of weekly, monthly, and seasonal offers that are available. These include game specific bonuses for slots and table games, free spins, additional match bonuses, and even referral bonuses. Loyalty is a fundamental thing when it comes to online casinos. It is difficult to keep a client happy in the face of such fierce competition, so Casino.com is more than happy to reward its most loyal customers. Players that enrol in the VIP program can collect special loyalty points that can be exchanged for real hard cash. The more points are collected, the higher players climb up the VIP tier ladder. And the higher tiers are unlocked, the better the benefits and prizes! This Casino.com review would be incomplete without a detailed summary of the games available at this online casino’s gaming lobby - and Casino.com surely does not disappoint! In fact, players reading this Casino.com review will be happy to know that there are over 300 games to choose from. In addition to quantity, the quality of these games could not be better, with the majority of them being supplied by software giant Playtech. When it come to slots, there are over 230 diverse and interesting titles to choose from. These come in a wide range of options, such as classic reels, video slots, multi-reel, multi-spin, and even multi-payline slots. Furthermore, players can also choose from a wide range of progressive jackpot slots that can dish out some serious life changing prizes. These include some popular titles such as Justice League, Mega Fortune, Age of Gods, and Esmeralda. Standard slots also come in a wide range of themes and concepts, including adventure, mystery, Marvel themes, mythology, and pop culture reference. Popular games include Starburst, Leprechaun Hills, Guns n Roses, and Gladiator. And yet, slots are not the only relevant games that players can choose from at Casino.com. Blackjack enthusiasts will be happy with the 10+ choice of game available, with popular games such as 21 Duel Blackjack, American Blackjack, and Blackjack Progressive. The same can be said for Roulette games, which are represented by over 10 games in Casino.com. Established variants such as European, American, and French roulette are available, as well as other more modern variants such as 3D Roulette, Multi-wheel Roulette, and even Marvel Roulette. Poker players at Casino.com have a wide variety of games to choose from, with over 20 titles in total spanning traditional games to video poker. These include popular games such as Caribbean Stud Poker, Texas Hold’em, and Pai Gow, as well as video poker games such as Joker Poker, Jacks or Better, Aces and Faces, and Deuces Wild. There are also other prominent table and arcade games available at Casino.com, including fan favourites such as Craps, Sic Bo, scratch cards, Keno, and Pop Bingo. Last but not least in this Casino.com review, players will be excited to know that Casino.com also offers 9 great live dealer casino games. These games combine the authentic feel of a land based casino with the comforts of home. Players can choose from a wide array of live dealer games, including Live Roulette, Live Blackjack, Live Baccarat, and Live Casino Hold’em. There are a number of payment options that player reading this Casino.com review can make use of when depositing money and cashing out winnings at this online casino. These include popular options such as credit and debit cards by renowned providers, e-wallet services, prepaid cards, and online bank transfers. Different payment options come with different transfer times, and players are always advised to check these out before selecting a payment option. Most of the options available at Casino.com take up to five business days to clear payments. It is important to mention in this Casino.com review the dangers of gambling addiction, which Casino.com takes very seriously. In fact, this online casino offers certain services and resources as implied through its UKGC licensing. The site also works with organisations such as CamCare, GambleAware, and Gambling Therapy. Casino.com only accepts players that are aged 18 and over. When it comes to on-site security, Casino.com employs the latest encryption technology and security. All of the transactions made on this website are overseen by Thawte, which happens to be one of the leading payment security processing firms in the business. This Casino.com Review would be incomplete without mentioning the customer support services available to players that visit this online casino. There are a number of 24/7 options for getting in touch with one of their customer services representatives, including phone support, email, and live chat. In addition, there is a comprehensive FAQ Section on the website that can assist players in answering some of the most common queries. As already indicated in this Casino.com review, this online casino also offers its players on-the-go play on a number of mobile devices. This Casino.com mobile review will be covering all the key features that mobile players need to know before they start playing their favourite games on their devices. Firstly, players can play on mobile by loading the casino directly in the web browser of their device, which will redirect the user directly to Casino.com mobile website version. The second option is to download the designated App that is available for iOS devices such as iPhones, iPods, and iPads. There is a special App for Android users, but this is only available to selected members, which is quite unfortunate. As such, Android mobile users need to load the online casino website directly on the device’s browser. Players reading this Casino.com mobile review will be happy to know that logging into your account through your device is as simple as doing so on a desktop computer. Users that download the designated App can logging automatically, while users playing on the mobile website version in the web browser need to login each time they visit the website. When it comes to promotions and bonuses, players going through this Casino.com mobile review should be aware that all the feature discussed in the previous section of the Casino.com review also apply for mobile users! That is correct – players using their mobile devices to open up a new account will also be eligible for the same welcome bonus package as desktop users. One of the highlights of this Casino.com mobile review is without a doubt the game selection that is offered to mobile players. In fact, players have access to over an incredible 150 titles, which is a far greater choice that is offered by most mobile casinos. As expected, slots account for the highest amount of mobile compatible games, with over 130 games available. In addition to these, players can also choose from a variety of table and card games, including Roulette, Blackjack, and Poker. In addition, mobile players also have access to 6 different Live Dealer casino games, including live Baccarat, Live Blackjack, and Live Roulette. Overall, we have to say that Casino.com is an excellent choice for both new and established online casino players. In this Casino.com review and Casino.com mobile review, we covered all the main features that one should look through when choosing a new casino to open an account. The welcome bonus and other promotions offered by this casino are top notch, and also cater to the needs of players that have already opened an account. There is a great selection of games available, with over 300 titles powered by industry giants Playtech. The repertoire of games itself is very diverse, and includes anything from slots to arcade games, table games, card games, video poker, and even live dealer games. There are a number of efficient payment methods for players to choose from, and 24/7 support services ensure that clients can always find assistance when they need it. Casino.com is also committed to responsible gaming, and it provides a very secure online environment for transactions. Also indicated in the Casino.com mobile review, players have the option to access this online casino on mobile devices such as smartphones and tablets. Both Android and iOS users can access the Casino.com mobile website through the web browser, but only iOS users have a designated App for them. Despite this setback, this Casino.com mobile review has managed to highlight the extensive selection of games available to mobile players, which is one of the main strengths of the mobile version. We have to say that this Casino.com review and Casino.com mobile review highlight the professional and versatile approach that this online casino has to its clients.